A newborn’s appearance changes — sometimes dramatically — over the few weeks after birth. For example, you might notice that your little tot’s eyes and hair change in colour, and his skin may become lighter or darker. One of the things that will almost always change is your baby’s skin. Before you leave hospital or even a few days or weeks after coming home, there is a possibility that your newborn’s skin will start peeling or flaking. But before you start worrying, rest assured that is perfectly normal, and soon, your little one will have that fabled “baby smooth” skin you hear of. So if you are curious to find out why your baby’s skin peels and how you can look after his delicate skin when this happens, you’ve picked the right article to read — here’s all you need to know about newborn peeling skin. 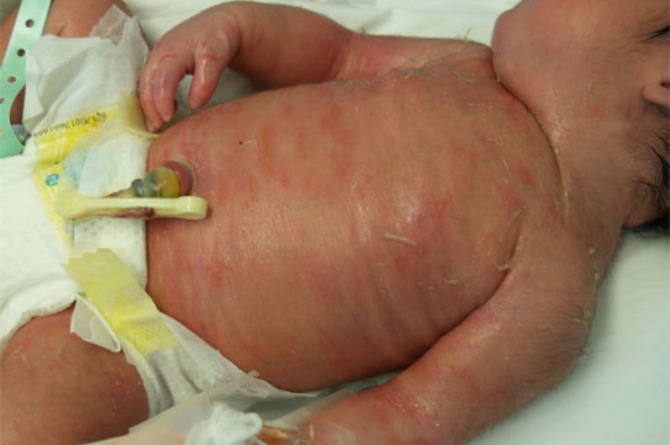 Why does a newborn’s skin peel? Seconds after birth, a newborn is covered in various fluids and substances, including blood, amniotic fluid and vernix. Vernix is a waxy, cheese-like substance that naturally occurs in the last trimester of pregnancy, thickly coating a baby’s body. The main purpose of vernix while your baby is still in your womb, is to protect his skin from amniotic fluid. In other words, it acts as a natural moisturiser. However, once the vernix (along with the amniotic fluid and blood) is wiped off your baby’s skin soon after birth, your little one will begin to shed the outer layer of his skin, says Healthline. Newborn peeling skin: Newborn skin peeling usually occurs on the hands and feet. Image from Pinterest- Stanford Medicine. How much peeling will occur? The amount of peeling depends on whether your baby was born prematurely, on time, or was overdue. Generally, the more vernix a baby has on his skin at birth, the less he may peel, say medical experts. For example, a premature baby will usually peel less than a full-term or overdue baby, because he is covered with more vernix at birth. You will usually notice newborn skin peeling within a week to three weeks after birth, most often on your baby’s hands and feet. Sometimes, the peeling of your baby’s skin could be caused by other conditions such as eczema or seborrhoeic dermatitis (cradle cap), according to Healthline and Dr Mark Koh Jean Aan of the Paediatric Dermatology Service, KK Women’s and Children’s Hospital (KKH) Singapore for Health Xchange. 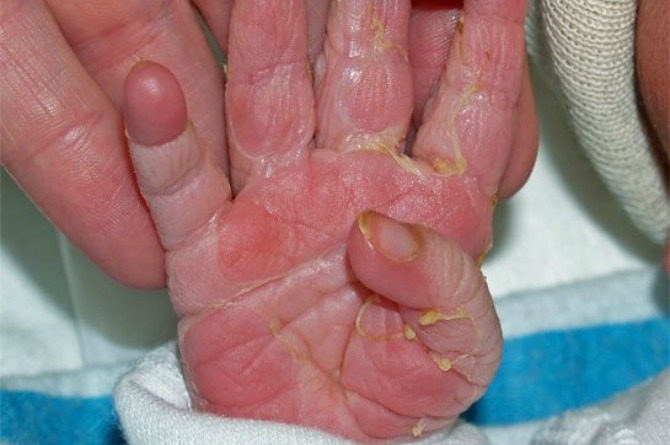 Peeling and dryness of newborn skin may also be caused by a genetic condition called ichthyosis. Eczema on a baby’s neck. This condition can be irritating for baby and unsightly to see, but can be effectively managed. Also known as atopic dermatitis, eczema can cause dry, red, itchy patches on your child’s skin — usually on the cheeks, at the joints of the legs and arms, or other places where your baby’s skin naturally folds, like the neck. Dr Koh explains that while the exact cause of eczema is not known, it is an immune reaction and a genetic condition, often running in families. Triggers that can worsen this condition include house dust mites, viral infections, some vaccination and high temperatures, as well as allergens such as detergents, soaps and creams, says Dr Koh. If you suspect your infant has eczema, consult your paediatrician without delay, as he can advise you on the best course of action to treat the condition. Bathe baby daily with slightly warm water and a mild soap or soap substitute. Don’t rub your baby’s skin dry — pat it dry instead. Use a recommended moisturiser every day to prevent and control eczema flare-ups. If your baby gets really bad eczema flare-ups, a mild steroid cream may be prescribed by a doctor. Applying expressed breast milk on skin affected by eczema. You can even give a breastmilk bath if you have enough expressed breastmilk to spare. If eczema is present on baby’s cheeks, clean the area well after each feed with clean water and a clean cotton ball. On the next page, read about other conditions that may cause newborn skin peeling. There’s also great information on how to treat normal dry, peeling skin in your newborn (not associated with a skin condition). This condition is also known as ‘cradle cap’, which will also cause your baby’s skin to peel — usually on the scalp, but also sometimes on the neck, eyebrows, armpits and groin areas. “Cradle cap occurs due to an overgrowth of a normal skin fungus / yeast, secondary to stimulation from maternal hormones while the baby is still in the womb. However, in some babies, it may be an early sign of atopic dermatitis or atopic eczema,” says Dr Koh. Cradle cap usually presents as scaly pink to red patches on the affected areas of skin. Cradle cap usually clears up on it own within a few months, or less. 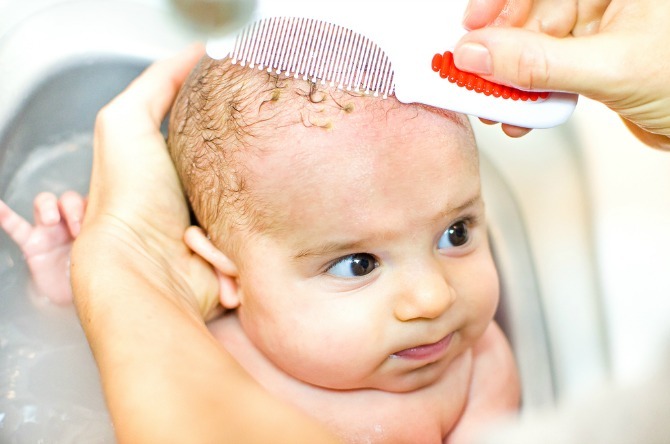 Wash your little one’s hair/ scalp once a day with a mild baby shampoo. Brush the scalp lightly with a soft brush to help loosen the flakes of skin. Dr Koh suggests rubbing some olive oil on your baby’s scalp, one hour before bath time. This will help loosen the flakes of skin. If frequent shampooing doesn’t help, doctors at Mayo Clinic recommend consulting your baby’s paediatrician who can suggest an appropriate solution. Do not use over-the-counter dandruff shampoos or other creams or products as they could have a harmful effect on your baby’s health. 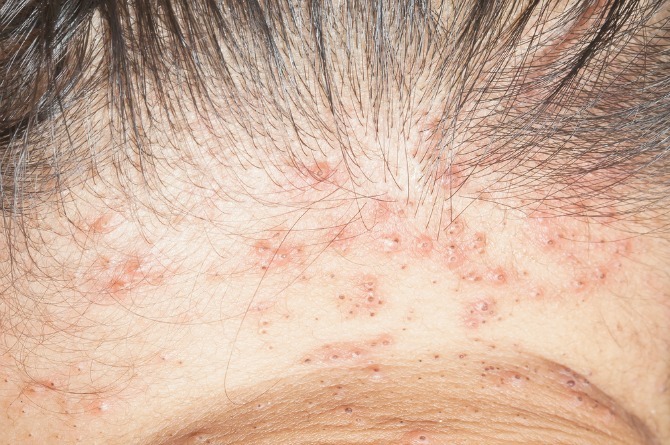 This is a genetic condition that results in itchy, scaly skin and skin shedding, according to Healthline. Your baby’s doctor may take a blood or skin sample to diagnose this condition in your baby, as well as via a physical examination and based on your family’s medical history. There’s no cure for ichthyosis. Do keep in mind that your baby’s doctor is the best source of professional advice for personalised information on how to manage this condition and what products to use on your little one’s skin. Head to the next page for important information on managing your little one’s peeling skin. While peeling skin is perfectly normal in newborns, some parents might get a bit worried that their little one’s skin is getting too dry, or even cracking in places. Here are some tips (adapted from Healthline) to help get your baby through this phase, emerging with soft, smooth skin at the end of it! Apply a gentle, hypoallergenic moisturiser on your newborn’s skin twice a day, especially after bath time, which will help keep his skin moist. Speak to your baby’s doctor about the best brand of moisturiser to use. As you apply the cream or lotion, gently massage your baby’s skin as this can help loosen dry skin. Breastfeed/ bottlefeed on demand or according to your schedule. This will help keep your baby hydrated which in turn will assist in reducing dry skin. REMEMBER: Do not give your baby water until after he is six months old, as it can be harmful to your baby’s health. Read this article to find out why. While a daily bath can help your baby’s peeling skin, remember to keep bath time short. This is because being immersed in water for a long time can strip your newborn’s skin of natural oils, aggravating his dry skin. A good bath time duration is 5-10 minutes. Also, use lukewarm instead of hot water, and stick to soap- and fragrance-free cleansers and a soft wash cloth. Don’t rub at your baby’s skin with the wash cloth, instead, clean his skin gently with circular movements. Remember that regular soap and body washes may be too harsh for your little one’s delicate skin. Harsh chemicals in perfumed skincare products or even laundry detergents can irritate your newborn’s delicate skin, prolonging and making worse his dry, peeling skin. Stick to perfume- and chemical-free skincare products and look for clothes detergents specifically designed for a baby’s sensitive skin. If you use an air-conditioner in your baby’s room, this will dry out the air in the room, potentially making your baby’s skin-peeling worse. It can also aggravate conditions such as eczema. Try using a humidifier to add moisture to the air, which will improve the condition of your little one’s skin. Parents, we hope you found this article useful. Remember, if you are in doubt about anything related to your newborn’s skin, or health in general, consult his paediatrician without delay. Also, if your baby’s dry, peeling skin lingers on for more than around a month, or worsens, it’s best to consult with a medical professional. Did your baby’s skin peel when he/she was a newborn? Or is this currently happening to your newborn? Share the ways in which you manage/d this condition in the comment box below.